Fiverr is one of the most popular and reliable freelancing website to get real buyers and genuine sellers. Hardly is there fraudulent persons there as the support takes pro-active actions once such persons are spotted. We’re taking a look at 5 best gigs on fiverr that can super-charge your blogger site and take it to the top where it is supposed to be. About two sellers in this list is known to us as our team has done business with them in time past. This was one of the first gig I ordered on fiverr while still using the blogger platform. Logo is a very important aspect of any website irrespective of blogger, wordpress, wix, typepad and/or any content management system. Arundaskm in his logo design services offers his clients the best he could till their satisfaction. Are some features that graces his gig’s page. This is hands-down the best and cheapest service you can get for migrating your blog from blogger to WordPress. It is very normal to start blogging from blogger but very strange to continue there when your blog matures or become very popular than could be managed effectively by an individual poster. And I will also setup proper plugins, basic SEO, correct permalinks and every other stuff needed to make the migration a success. Then it works with Google+, Drive, and Picasa out of the box! He also adds the free extra of tweaking your blog to suit your needs. I can tweak your site to your liking. And I can make it so that your blog posts appear on a separate page from your landing or home page. I can make certain things appear only on your home page. And more! 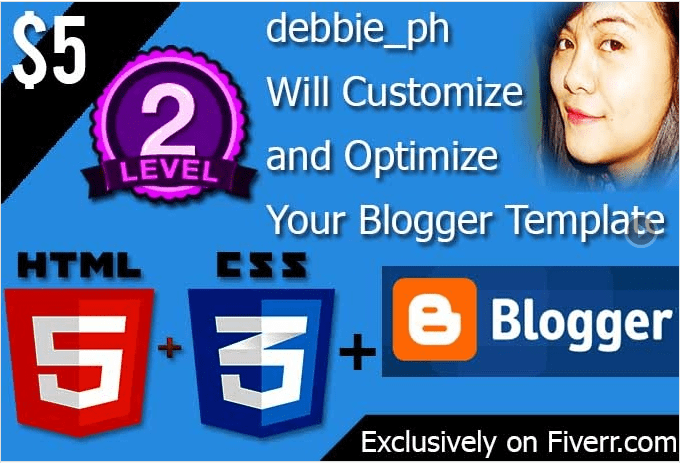 Debbie_ph offers custom blogger templates design and has so far been successful on delivering this service to his clients. His service also features modifying your current templates as well fixing minor issues on them. There’s enough positive reviews on his gig’s page to convince any potential client of his. Ladina seems to be so vast in what she does with blogger and WordPress. In her gig’s page she promised to deliver the most professional, reliable and cheapest blogger custom domain mapping service. Her custom domain mapping service extends to other content management systems. We have listed the few we could pick from credible fiverr sellers offering gig’s related to Google’s blogger and blog design services. The ball is now in your court. Are there other fiverr seller’s with gigs related to blogger you think we’ve left out in this post? Kindly share with us below. Next PostTop 10 Keyboard Shortcuts? Previous PostHow To Sign In Multiple Skype Accounts On A PC?